Our team brings you live updates of the most important events and developments in the Balkans as they happen. “I am protesting because i think it is not too late for changes, as much as some tell us hitting the streets is useless now,” says Sofia Balac, photography student at the Academy of Arts in Novi Sad. She says she voted in the presidential elections because “others have fought hard so we can have that right”, but also because it is “useless to sit and complain if you do nothing to change things”. “For the first time in a long while things are moving, even if the people do not know exactly what they want yet. I hope there is a chance to build an alternative to the current state of affairs. At the very least we can make the politicians realize they can not do whatever they want with us,” said college student Alexandar Vracaric. He says did not vote in the presidential elections, not because he is not interested in politics but because he did not want to give legitimacy to any of the candidates. 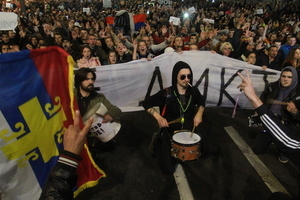 The long queue of anti-government protesters reached the government building in Belgrade holding a banner “Down with a Dictator” and headed by drummers. Several hundred people in the town of Cacak protested tonight against Aleksandar Vucic’s rule. They walked to the seat of the local branch of Vucic’s Serbian Progressive Party and shouted “Thieves, out” and “We want jobs, not sandwiches”. 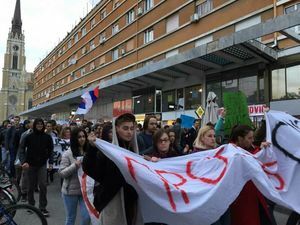 Two hundred protested in Kraljevo, mostly college and high school students. They gathered at the city square and walked the streets. 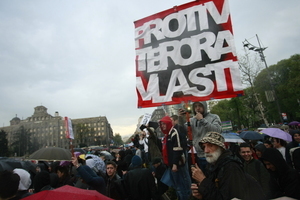 About a hundred walked in the town of Krusevac from the City Parliament to the main square and back carrying banners. Protesters in Novi Sad blocked the street leading to provincial public broadcaster RTV earlier tonight. They said they did not want someone to attack the building and accuse protesters. “Five years of thefts, lies, false degrees … and breach of of Constitution. It is too much! I don’t want ‘90s [back]. I want 21st Century,” said physicist Milos Vlainic who participated in protest in Novi Sad. Protests in Novi Sad ended peacefully. 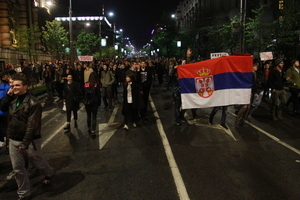 Street sellers in Belgrade are offering Serbian flags to anti-government protesters. News agency Beta reports that around 8,000 people protested earlier tonight in front of the government building in Belgrade. 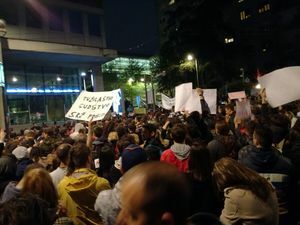 Protesters in Belgrade shouted “Down with Dictatorship” and “Get Out” in front of the building of the State Electoral Commission, RIK. One smaller group returned in front of the building of the parliament, where the protests started earlier tonight. One of the demonstrators demands is the removal of the top management at the State Electoral Commission. Several hundred people protested in the mining town of Bor, blocking traffic and chanting against Serbian PM and President-elect Aleksandar Vucic. The protest began an hour earlier than scheduled and went without incident. Informal organizers animated the crowd with megaphones, Beta news agency reports. 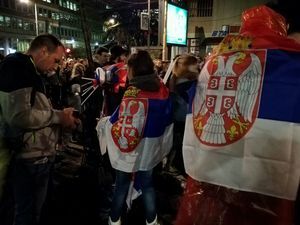 Belgrade’s anti-government demonstrators returned in front of the parliament building shouting against Serbian Prime Minister and President-elect Aleksandar Vucic. The protest is now ending with people shouting "Tomorrow at 18h!". The head of Kosovo opposition initiative Nisma, Fatmir Limaj, has called for a no-confidence vote against the current government, made up of the Democratic Party of Kosovo and the Democratic League of Kosovo. An MP from the opposition Vetevendosje movement, Rexhep Selimi, also said that they would support this initiative, according to a report by Radio Television of Kosovo, RTK. European Parliament passed on Wednesday the draft of the decision concerning the application of provisions under the Schengen Information System, SIS, in Croatia, which the first step towards abolishing check-ups at the EU’s internal borders to Croatia. Croatian MEP Tonino Picula said that he hopes Croatia will soon join the EU’s passport-free Schengen zone since the country "fulfils all the requirements". Sixty-five per cent of Macedonian citizens believe their country is moving in the wrong direction, while 44 per cent think that the political crisis is the most serious problem, the latest opinion poll conducted by the National Democratic Institute, NDI, shows. 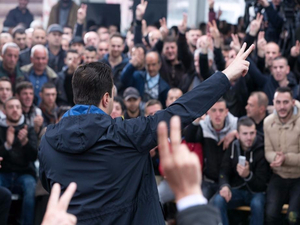 Against the backdrop of ongoing protests in the country against the so-called "Albanian platform", the research shows that a staggering 81 per cent of the population has never even read the platform signed by the Albanian parties. Concerning the current blockades for formation of the announced opposition led-coalition government, 51 per cent of the respondents think that the opposition Social democrats, SDSM, have the authority to lead the next government. When it comes to the Special Prosecution, formed to investigate high-level crime, 59 per cent of the respondents believe that its mandate for raising charges that ends later this year should be extended. Maksim Dimitrievski, an MP from the Social Democrats, SDSM, was physically attacked on Wednesday night while in a restaurant with his family in the town of Kumanovo in Macedonia’s north. Dimitrievski confirmed the attack to media, saying that he was assaulted by about ten unidentified persons who he suspects were under the influence of alcohol. 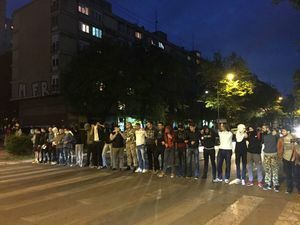 The police are investigating the case, which comes amid a tense political situation in the country where President Gjorge Ivanov and the right-wing VMRO DPMNE party are blocking the announced formation of an SDSM-led, coalition government. 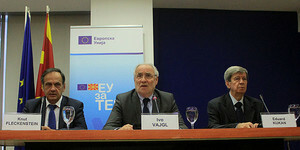 Macedonia is on the wrong path and risks losing its recommendation for EU accession talks to commence unless the right-wing VMRO DPMNE party allows the formation of the new Social Democrat-led government without delays, MEPs Ivo Vajgl, Eduard Kukan and Knut Fleckenstein, who are rapporteurs for Macedonia, said in a joint press release on Thursday. In a message clearly directed to the VMRO DPMNE party, the three MEPs underlined that the party's tactics for delaying the election of a new parliament speaker and for opening the path for election of new government must end. These remarks come after on Wednesday many MEPs at a European Parliament session dedicated to Macedonia expressed deep concerned about the political stalemate after the December 11 elections. The management of the Independent Journalists' Association of Vojvodina, NDNV, in the northern Serbian city of Novi Sad received death threats on Wednesday night after Belgrade-based tabloids Informer and Alo proclaimed them as organisers of the mass anti-government protests staged in the city post-Sunday’s presidential election, the organisation announced in a press release on Thursday. 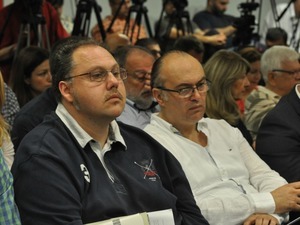 NDNV, and the Independent Association of Journalists of Serbia, NUNS, stated that the claims are false and that the outlets they appeared in were “regime tabloids". NUNS and NDNV urge the competent authorities to react urgently and to punish the perpetrator who sent the threats via social networks, noting that his Facebook profile indicates “his closeness to the Serbian Progressive Party". The death threats have been reported to police and the prosecution for high-tech crime under the mechanism established in the Agreement on cooperation and raising the safety of journalists, which was signed by the police, prosecutor's office and journalists' and media associations. However, media associations claim that this mechanism has not provided any results in its work so far. "The management of NDNV and its colleagues have previously been targets of death threats, and these cases are regularly reported to, but still there is no one answer, (from prosecutors or police)," the press release stated. "The management NDNV and its colleagues previously have been the target of serious death threats, and these cases are regularly reported, but still there is no answer [from prosecutors or police]," according to the press release. 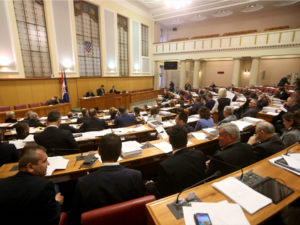 With 83 votes in favour, 46 against and two abstentions, Croatian parliament passed the Law on Procedures for Extraordinary Management in Companies of Systematic Significance. The law, nicknamed “Lex Agrokor” by media, is generally considered to have been created for Croatia’s troubled private company Agrokor, as it is practically the only company in the country which would meet the criteria outlined in the legislation for giving the state a role in a company’s crisis management. Croatian police told news site Index that they have started initial pre-investigative activities concerning a criminal report filed last week by the chair of parliament, Bozo Petrov, against the owners and management of the ailing private company Agrokor. 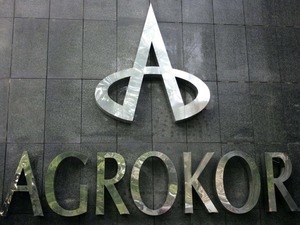 Petrov reported the Agrokor owners and management over alleged irregularities in the company's financial reports that led to its current financial crisis. For the forth day in a row, protesters have gathered in front of the parliament building in Belgrade at the rally against the rule of Serbian Prime Minister and President-Elect Aeksandar Vucic. 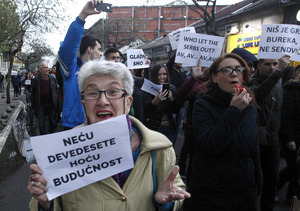 Protests are being also staged in other towns, including Novi Sad. Anti-government protests are being held again in Serbian southern town of Nis where hundreds of mainly young people took a protest walk. 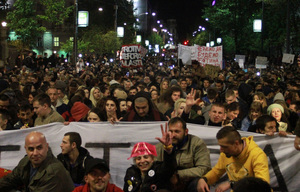 Around 1,000 people took the streets of Novi Sad protesting against the government. 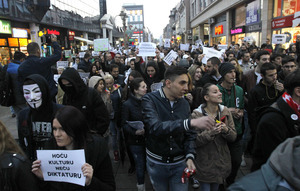 Novi Sad's protests are organised by local Students Movement. 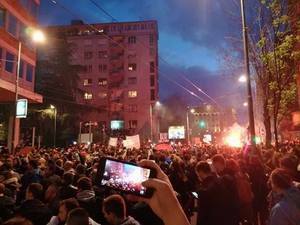 Local media report that tonight’s anti-government protest in Nis is biggest staged so far in this southern Serbian town. 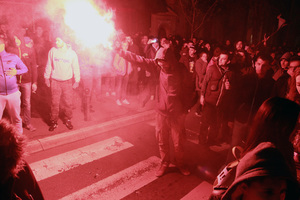 Anti-government protests are being held in towns across Serbia, including Kragujevac, Kraljevo, Sombor, Novi Sad and Nis. Belgrade anti-government protesters pelted public broadcaster building with eggs. 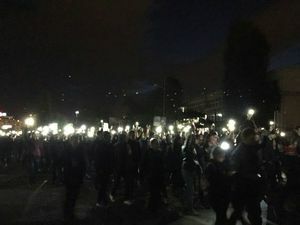 Public lights in Serbian towns of Nis and Novi Sad went off, prompting protesters to accuse local authorities they are using blackouts to ‘hide’ number of protesters. 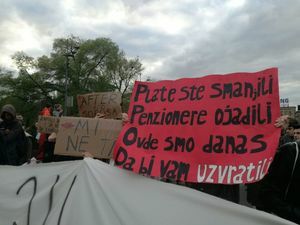 Among several thousands in anti-government protesters in Serbian town of Nis was a number of pensioners, families with children and former employees of bankrupted public companies. Demonstrators carried banners “You Try to Live on 200 Euros” and “We are Hungry” as they walked through the city. With the sound of drums and whistles they shout “Vucic Tief, You Stole the Vote!,” “You Betrayed Serbia!” and “We Do Not Give [You] Nis!”. Anti-government protest in northern Serbian city of Novi Sad ended. The rally went peacefully, with one girl injured by firecracker. About 100 people protested against Serbian government and Prime Minister Aleksandar Vucic in Serbian town of Krusevac. Protests against what demonstrators call “dictatorship” of Serbian Prime Minister and President-Elect Aleksandar Vucic are ending in Belgrade with shouts "See You Tomorrow!" Several thousands citizens, mainly youth, were walking through central Belgrade streets shouting “Vucic Theif!” and “Down with Dictatorship!”. Citizens wave and greeted them from their balconies and windowds as they passed through the city. At one moment, the public lightening in central Kralja Milana Street went off as protesters were passing. In front of the building of the Central Electoral Commission protesters asked “Where are Our Votes!” protesting against the irregularities during April 2 presidential elections. Protesters in Serbia are calling for the immediate resignation of the government as well as Maja Gojkovic, the Serbian parliamentary speaker who they claim unlawfully prorogued parliament during campaigning ahead of Sunday’s presidential vote. Other demands include cleaning up the electoral roll that is said to contain the names of more than a million ineligible voters - including deceased Serbs - and implementing measures to ensure the public broadcaster is independent from government and free of political influence. They are also demanding the removal of the top management at the Regulatory Authority for Electronic Media and the State Electoral Commission. New special law for companies of systematic significance for Croatia, labelled the 'Lex Agrokor' after the troubled economic giant, may be unconstitutional, law experts maintain. Read more. Aleksandar Vucic may have won the presidential race hands down - but the election campaign was so unequal as to raise serious questions about his legitimacy. Read more. While many of the grand old buildings in Romania’s capital are now valued and increasingly sought after on the real estate market, others are caught up in endless litigation or are simply left to rot. Read more. As a response to recent terrorist attacks in Europe, the EU introduced stricter check-ups starting on Friday on its external borders, as well as towards member states that are not a part of the Schengen passport-free zone. Documents will be checked through databases – both national ones and Interpol's – which will cause occasionally longer waiting times at borders. Serbian Prime Minister and President-elect Aleksandar Vucic proposed to erect a 100-metre-tall flagpole that will fly the national flag in Belgrade and will be visible from almost every part of the city, daily newspaper Vecernje Novosti reports. The goal of the project is to “strengthen the cult of the flag“, according to the newspaper. The giant pole will be erected near the confluence of the Danube and Sava rivers in the Serbian capital, with other towns in Serbia and the region expected to follow Belgrade's example, Vecernje Novosti reports. Croatian lawyer Hrvoje Simic has reported Antonio Alvarez III – who is being brought in from the US as chief restructuring officer for the troubled private Croatian company Agrokor - to the customs administration for allegedly working without a working permit, claiming he has not been registered by his employer. He also reported global consultant agency Alvarez & Marsal, where Alvarez is an executive director, as well as Agrokor and its management. 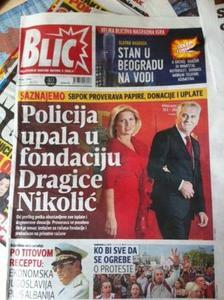 The Dragica Nikolic Foundation, a charity organisation founded by the wife of Serbia’s outgoing President, Tomislav Nikolic, is under investigation on suspicion of fraud, Blic Daily reported today. BIRN could not independently verify the information reported in Blic. 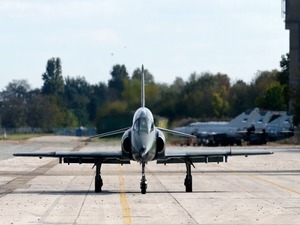 A military plane crashed on Thursday morning near the city of Sabac in western Serbia, public broadcaster RTS reported. It is not yet known if anyone has been injured in the incident. Bosnia's Council of Ministers has, at an emergency session, put together a new law package and put it forward to the upper house of parliament, the House of Peoples, for the urgent consideration of amendments to excise duty and other financial laws. The lower house, the House of Representatives, on Wednesday voted not to consider the laws urgently. The amendments though are a requirement of the loan extended to Bosnia by the IMF, which has said the failure to adopt the reforms will delay the program. According to public broadcaster BHRT, the House of Peoples will sit today, and the Council of Ministers hopes that this will put urgent discussion of the amendments back on the agenda for the House of Representatives at a session next week. The Constitutional Court of Croatia stated on Friday that the Law on Consumer Crediting and Law on Credit Institutions is in accordance with the country’s constitution. 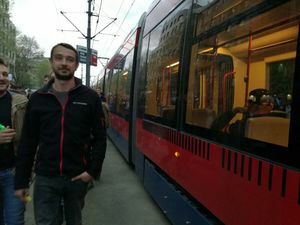 The law was passed in 2015, during the reign of the former centre-left government, as a way to convert all Swiss franc loans into euros as an immediate response to hikes in franc exchange rates. 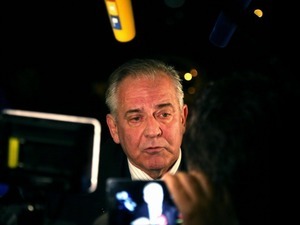 Former Croatian Prime Minister Ivo Sanader was sentenced to four-an-a-half years in prison by the Zagreb County Court on Friday for his role in the so-called “Planinska case”. 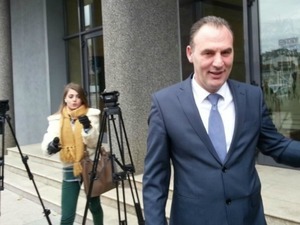 The second and third accused in the case - former politician and businessman Stjepan Fiolic and businessman Mladen Mlinarevic - each got a one-year prison sentence, which they will serve in the form of pubic community service. Additionally, Sanader has to return 2.2 million euros to the state for damages he caused to it. 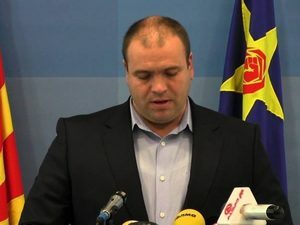 Sanader was found guilty of buying an overpriced building for the Ministry of Agriculture in Zagreb’s Planinska Street from a company owned by Fiolic in 2009. Two pilots from the Serbian Army - lieutenant colonel Nenand Culbrik and captain Dejan Pandurovic - were killed in this morning’s plane crash near the western city of Sabac during a routine training flight, Serbian media are reporting. The cause of the accident remains unknown and a special commission has been formed to investigate the circumstances of the crash. It remains unclear if anyone else has been injured in the incident. 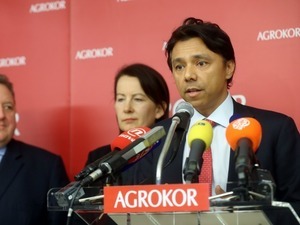 The team for crisis communication of the Croatia’s biggest private company, Agrokor - currently going through a financial crisis - said on Friday that it will not activate the newly passed Law on Procedures for Extraordinary Management in Companies of Systematic Significance. Agrokor's legal team is still evaluating the new special law - which can be triggered by debtors and lenders in cases for companies with over 5,000 employees and over one billion euro debt - and its legal consequences. If the law is triggered, the commercial court names an extraordinary manager of the company – proposed by the Ministry of Economy, who will run the process of restructuring the company, while all debts are put "on-hold". The two leaders of Albanian politics – Prime Minister Edi Rama and head of the opposition, Lulzim Basha - are mulling holding a meeting in an attempt to deal with the political crises that has arisen as a result of opposition protests that started on February 18, in which demonstrators are calling for the government to resign and a technical one to be formed in preparation for free and fair elections. 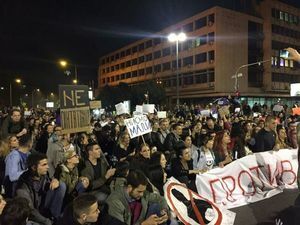 The protesters’ requests have not been accepted by Rama, although he invited his political opponent Basha to set the time and the date of a meeting between them to discuss the standard of the parliamentary elections – scheduled for June 18. 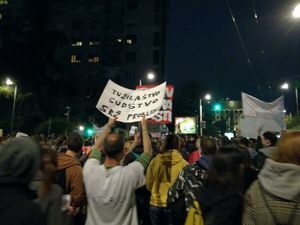 Opposition Lulzim Basha protesting in Tirana. Photo: Lulzim Basha/Facebook. The front page of Hrvatski tjednik (Croatian Weekly) on Thursday was covered with photos of Croatian public figures who signed the ‘common language’ declaration last week, which stated that Bosnian, Croatian, Montenegrin and Serbian are all variations of the same language, annoying conservatives. 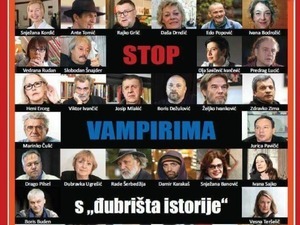 The headline read: "Stop to Vampires from the Junkyard of History", with the last three words written in Serbian, which has linguistic variations to Croatian. An initiative of intellectuals, activists and linguists, the declaration aims to tackle nationalism in the region, claiming that the people in the four ex-Yugoslav republics all speak a polycentric language. Suppliers of Croatia’s biggest private company Agrokor - currently going through a financial crisis - said that from Saturday they will not deliver their products to the company's retailer Konzum, which is the largest in the country, until the freshly made deal with Agrokor’s creditors and crisis management team is cancelled, news site Index reported on Friday. The suppliers, who claim they were left out of the deal, want a new one to be made with them included in it. According to media reports, Agrokor owes around 2.2 billion euros to its suppliers. 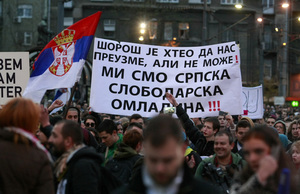 TV N1 reported that a pro-government counter-protest in Serbian second city of Novi Sad, gathered eight people. 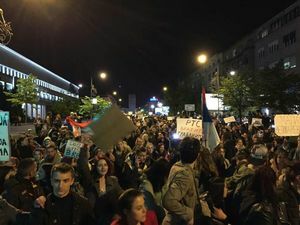 Novi Sad students have been staging protests against the rule of Serbian Prime Minister Aleksandar Vucic since April 3, gathering thousands of people. The rally on Friday gathered around 5,000 participants. Politicians in the Balkans frequently accuse the EU of double standards in its dealings with the region. Do they have a point? In the months-long protests in Serbia, those marching every weekend are not all demonstrating for purely political reasons – but also to raise their voices over other burning everyday problems.